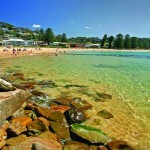 Recent trip to the Central coast of NSW and the pleasant surroundings of Avoca Beach. Liked it so much, plan to visit again in the winter & try out a few bowling greens. Along with the additional bonus of having family connections in the area.